DENVER, Colo. - A bill to repeal the requirement for background checks on firearm transfers between private individuals and the fees levied to carry out the background checks passed the Senate Judiciary Committee today on a 3-2 vote. SB15-086 – sponsored by Senator Kent Lambert (R-Colorado Springs) – is a repeal of legislation enacted by the Democratic legislature and Governor Hickenlooper in the controversial 2013 legislative session. The legislation has long been opposed by Colorado's Senate Republicans along with a variety of other groups and individuals, including the Colorado Sheriffs Association. 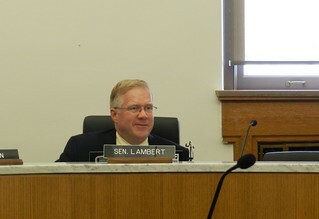 "The legislation passed by Democrats in 2013 criminalizes law abiding citizens for taking prudent steps to protect their firearms and families," Senator Lambert said. "I'm proud we took common sense action today to repeal measures that significantly infringe on Coloradans Second Amendment rights. Coloradans have been clear for years that they hold the Second Amendment near and dear to their hearts and I hope this legislation continues to get a fair hearing throughout the legislative process." "Since the Democrats’ unconstitutional restrictions on Second Amendment rights passed in 2013, two Democratic Senators have been recalled and Republicans gained the majority in the Senate," said Senate President Bill Cadman. "On the opening day of this year’s legislative session, I promised Coloradans that their new Republican Senate Majority would hold government accountable for irresponsible policies and today’s vote is another step towards that goal." SB15-086 will now head to the Senate Finance Committee for consideration.